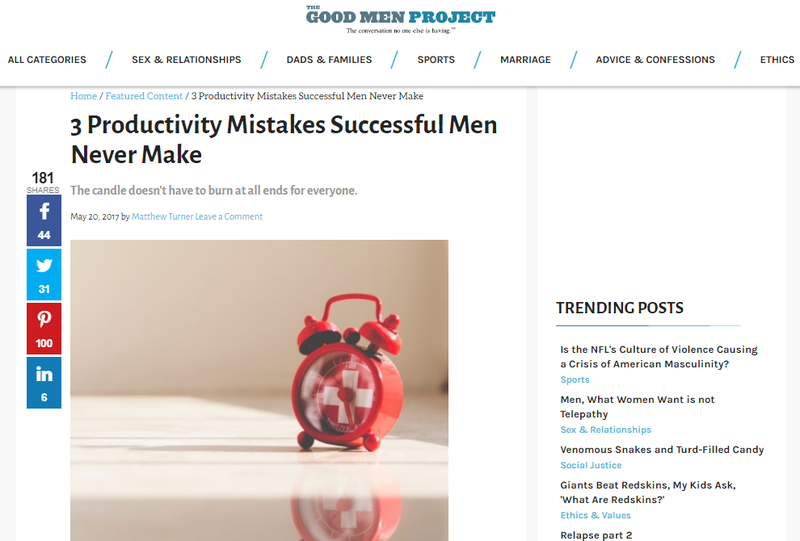 I recently published an article on The Good Men Project where I focus on three productivity mistakes that successful men (and women) never make. I wanted to tell you about this post here, and if you like what you see, you may like to read the rest. In 2007, Arianna Huffington collapsed and broke her cheekbone. She was at home on the phone when all of a sudden, she collapsed. When she woke up, she lay in a pool of her own blood and had what she would later discover was a broken cheekbone. Before this, she worked 18-hour days. She burned both ends of the candle. She juggled this with family life. She “hustled” like all good entrepreneurs do. And this, I’m afraid to say, is a mistake I see many success-seekers make. Maybe you’re one of them and if you are, you’re setting yourself up for failure. The one thing successful people value above all else is … TIME! Each day you’re given 1,440 minutes. That’s it. That is all. No more and no less, no matter how much or little you have to do. In the beginning of their entrepreneurial journey, many people lose sight of this. They waste their time, lose themselves in the “hustle”, and damage their health, relationships, and so much more. Then, at some point, they realise what a stupid thing they have done. They have a wake-up call, like Arianna had, and they turn their time management and productivity woes into HUGE success. What I’m about to share with you isn’t magic. It isn’t reserved for only those at the top of the pile.